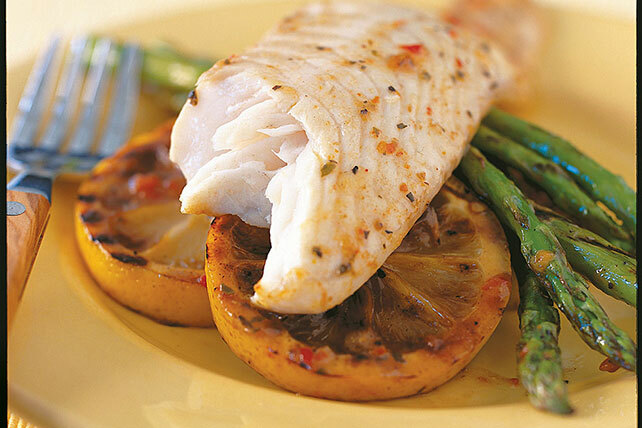 Try our Grilled Lemon Fish with Asparagus. Lemon and tilapia lovers will want to try this fabulous lemon fish recipe, with citrus zing and tangy dressing. This Healthy Living recipe takes just 10 minutes to prep. Squeeze juice from 1 lemon; mix with dressing. Pour half over fish in shallow dish; turn to coat both sides of each fillet. Refrigerate 15 min. to marinate. Refrigerate remaining dressing mixture for later use. Meanwhile, heat grill to medium heat. Cut each of the remaining lemons into 4 slices. Remove fish from marinade; discard marinade. Place 8 lemon slices on grill grate; top with fish. Brush with some of the remaining dressing mixture. Grill 5 min. ; turn. Add remaining lemon slices and asparagus to grill. Cook 5 min. or until fish flakes easily with fork and asparagus is crisp-tender, brushing occasionally with remaining dressing mixture. Remove fish, lemon slices and asparagus from grill. Discard lemon slices under fish. Serve remaining lemon slices with fish and asparagus.